I’m speaking out in defence of nature and democracy! Canada’s Harper Government is pushing through a bill to weaken many of the country’s most important environmental protection measures and silence the voices of all Canadians who seek to defend nature. The “Budget Bill C-38” is rewriting Canada’s environmental laws — and trying to silence advocates. “Bill C-38 brings in sweeping changes to Canada’s environmental laws. Fully 30% of the 420 page bill is actually not about the budget at all. 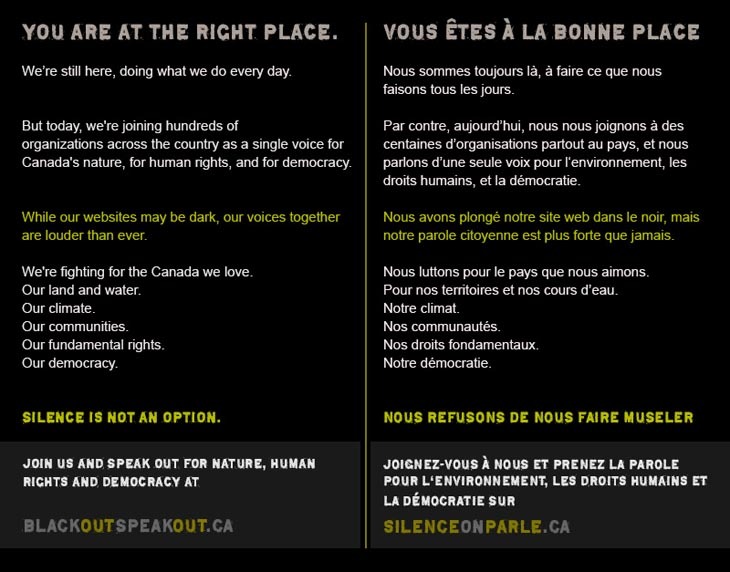 Speak out on June 4, 2012 in defence of two core Canadian values: nature and democracy. Visit Blackout Speakout for more information. 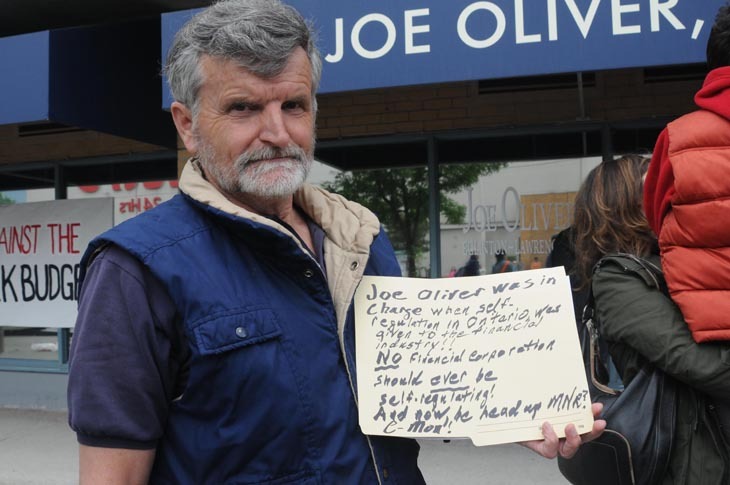 Photos © Franke James at LeadNow’s June 2/12 Rally at Minister Joe Oliver’s riding office in Toronto. What is Harper afraid of? Sources: Blackout Speakout, EcoJustice Analysis, Elizabeth May and Mike de Souza, PostMedia. This Blackout Speakout image was posted full size on June 4th on the front of www.frankejames.com. 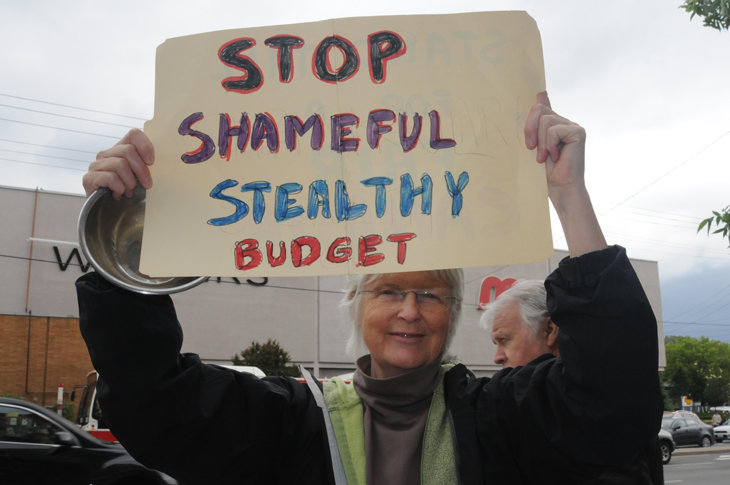 I was with about 20 people demonstrating at Michael Chong’s constituency office in Fergus yesterday. I think we can learn from Quebec student protests– the pots and pans marches can be an effective way to get a politician’s ear. We might need to have monthly, weekly, or even daily (if it comes to that) demonstrations to stop the implementation of Bill C-38. If a “nice guy” like Michael Chong is forced to face 20 people protesting this bill outside his office everyday, he might consider joining another party or sitting as an independent member. He was only born in 1971 and he’s already earned a full pension so he’s got nothing to lose if he chooses to represent his constituents over his party. Here’s a chance for a disgruntled former Progressive Conservative MP to be a political hero. 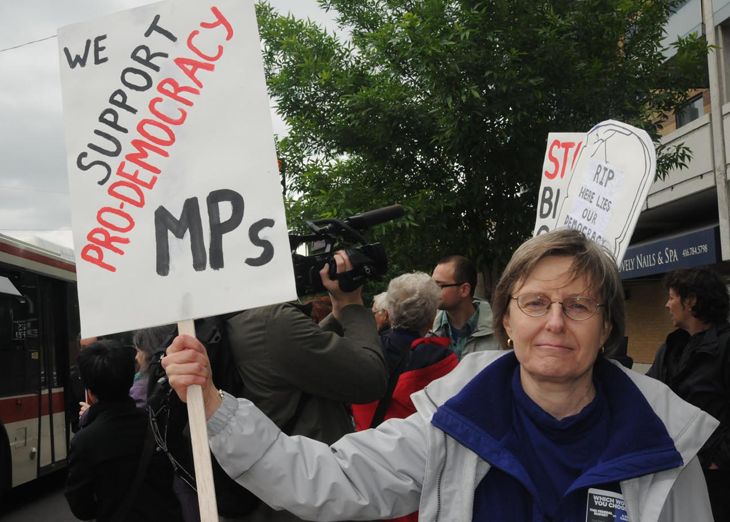 They might pass the bill before the summer break, but we can make plenty of noise before the fall session sits– let’s start pestering MPs to consider what’s in the best interest of their ridings, not what’s in the best interest of the party. I wrote this earlier today and on further pondering, I think Highway 6 in Fergus, Ontario is a perfect spot for big demonstration. #6 runs through the watershed of 3 great lakes on the way to Tobermory. Environmental deregulation is going to affect water everywhere. A big company with deep pockets can get a minister to overrule any decision. It’s time to hold members of THIS parliament to account– they spend so much time in question period questioning previous governments, they don’t want to answer questions about what they’re doing. It’s up to us as citizens to answer with more than “Bob Rae did this in Ontario twenty years ago and Mr. Mulcair had this portfolio in Quebec.” Big effin’ deal! It’s what this government is doing right now, not what happened in provincial legislatures in the past. Make some noise Canada! Casserole! Casserole! Casserole! Good for you Rick! Please convince the Hon. Michael Chong to do the right thing & become a Canadian Hero. Mr Chong has already proven himself to be a man of principle and also sits on the all party climate change caucus. Please keep up the pressure. PS I was out on the streets with my Pots & Pans last Wed. We need to hand out leaflets to educate bystanders because the mainstream media is not doing their job. Find some other decent conservative members of parliament, people who ran for parliament to lead and make a difference. This is their best chance to do just that!